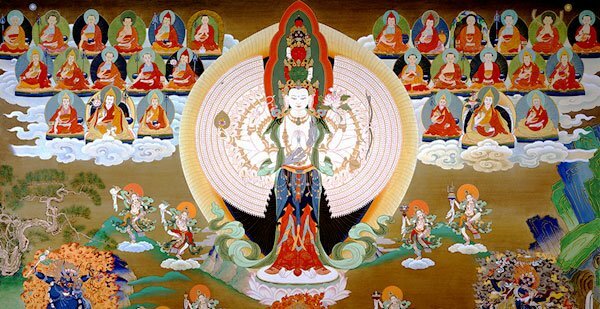 The meditation centers on the recitations, mantras, and guided visualisations of 1,000-arm Chenrezig, the embodiment of all the buddhas’ loving-kindness and compassion. Doing even one Nyung-Ne or “abiding in retreat” for just two days is said to be as effective as three months of other purification practices and is extremely powerful for healing illness, purifying negative karma, and opening the heart to compassion. Cost for the retreat is slightly higher than before, as we have booked an airbnb to help accommodate everyone! It is now $220, with a concession at $180. Bookings are essential, as this is a residential retreat and places are limited. Bookings open in February 2019. Please speak with Miffi at reception with any questions you may have about the practice, the times, receiving sponsorship, dietary restrictions etc. Can’t attend this year? We invite you to sponsor a fellow LTC member to attend in your place! The merit is the same as if one does it oneself! Any donations large or small are welcome, and will go towards sponsorships or the offerings. We invite you to write out your dedications for the group to read out together each evening. The introduction evening is essential for everyone doing the Nyung-Ne’s. We set up the altar, sort out sleeping arrangements, review the practice, and answer any dietary questions. BYO dinner. The retreat starts at 5 am and lasts for four days. We have four sessions each day, lasting up to two and a half hours. Each session includes guided meditation, reciting mantras, prostrations, and mandala offerings. The retreat is residential, and people are encouraged to stay on centre grounds during the entirety of the retreat. On the speaking days there is a tutorial in the afternoon that serves as the third session. On the fasting days we paint tsa-tsas during the breaks, as a way to keep alert but relaxed, and to enhance our concentration. We end on the fifth morning with a final session, and copious amounts of chai tea and dedications. We then have a group photo, pack up the gompa, and celebrate with a delicious, big breakfast together! You will be ready to go home by 10 am.